Kings’ School Al Barsha are an integral part of the successful family of Kings’ Schools, founded in 2004 with Kings’ School Dubai, the only school in the United Arab Emirates to have achieved an ‘outstanding’ rating by the Dubai Schools Inspection Bureau every year since inspections began. Having worked at Kings School in 2017 and 2016 when S+B and our agent NMC provided and installed 6 state-of-the-art laboratories furniture, we are now excited to return for the completion of another 2 laboratories and a food tech room. 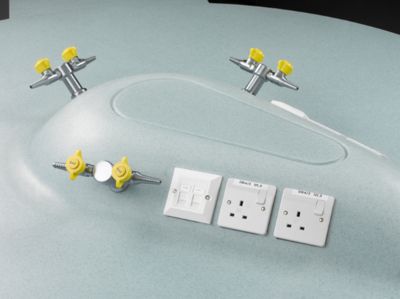 The lab furniture system chosen is the Saturn & Mercury with the moulded turret, Corian worktops and integrated sinks. Additional work surfaces, storage and services are provided around the perimeter benching. 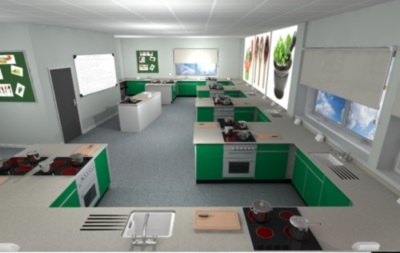 The Food Technology Room provides space for food preparation but also an environment for studying health, hygiene, nutrition and food science as well. The furniture system chosen is a modular rectangular peninsular benching and storage system which provides a flexible learning area suitable for both practice and theory classes. The built – in electrical services provide, safe, easy access for the connection of all appliances.